You might have read the play, one of William Shakespeare’s most famous, in high school or college and likely have seen a screen adaptation — there are dozens, but it’s hard to beat Franco Zeffirelli’s 1968 film with Leonard Whiting and Olivia Hussey. Romeo, played by GCU freshman Trevor Penzone, and Juliet, played by veteran senior Joy Flatz, share a kiss during the College of Fine Arts and Production’s performance of the popular Shakespeare work, which opens Friday in Ethington Theatre. Now, for the first time in Ethington Theatre’s 50-plus-year history, Grand Canyon University’s College of Fine Arts and Production is presenting “Romeo and Juliet.” Friday’s and Saturday’s performances are sold out, but tickets are still available for the 2 p.m. Sunday show as well as for shows at 7:30 p.m. Friday, Feb. 13, and Saturday, Feb. 14, and 2 p.m. Sunday, Feb. 15. For tickets, call the box office at 602-639-8880, email Ethington@gcu.edu or click here. The college has performed other Shakespeare favorites, among them “King Lear” and “Twelfth Night,” and “Hamlet” is on a future playbill. 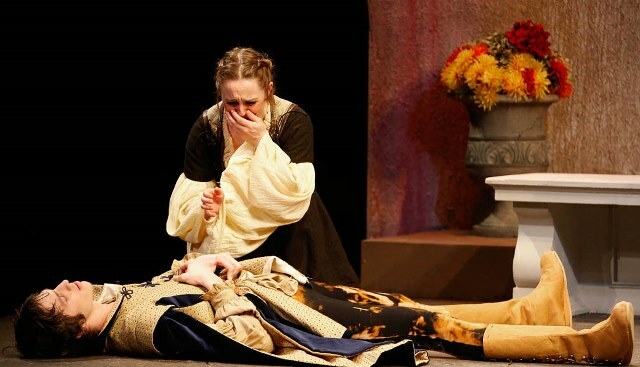 “Romeo and Juliet” is a good fit for COFAP, which strives to involve as many students as possible, because it has 21 roles, a chorus and many opportunities for students to build, sew and otherwise create an amazing theatre experience, said Director Claude Pensis, COFAP’s dean. It’s also a seasonal natural with Valentine’s Day being on closing weekend, the same weekend as alumni homecoming activities. Alumni have received complimentary tickets to the Feb. 13 performance. 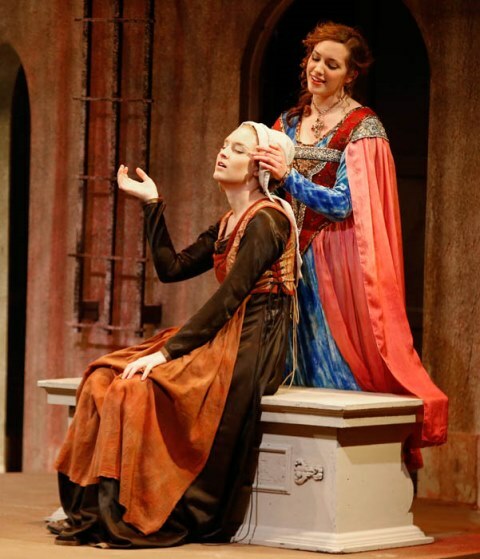 Nearly two months ago, before the “Romeo and Juliet” cast began poring over the play’s romantic language and the crew started building sets that mirror Italian architecture and piecing together costumes right out of the Elizabethan era, Pensis had a painstaking task. He had to trim lines from the play to avoid a production that could have run four hours. Shakespeare wrote “Romeo and Juliet” in 1595, the same year he finished “Love’s Labour’s Lost,” “Richard II” and “A Midsummer Night’s Dream.” Set in the northern Italy village of Verona, it’s the story of Juliet, of the House of Capulet, and Romeo, of the House of Montague, who fall in love. Long story short, this doesn’t go over well with the families. At the risk of not ruining it for anyone who doesn’t know the story — is there such a person? — we’ll just say it turns out badly for both kids. Cast in the role of Romeo is GCU freshman Trevor Penzone, a theatre performance major who never acted a lick until three years ago as a sophomore at Cactus Shadows High in Scottsdale, where he did “Macbeth” as a senior. Penzone said he was surprised to get the lead part, given COFAP’s other, more seasoned male actors. To no one’s surprise, they have helped him embrace and expand his big role. 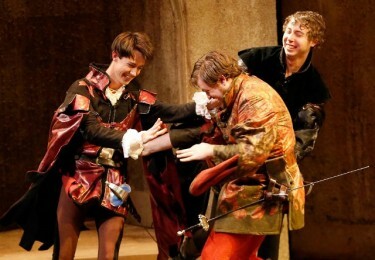 From left, GCU actors Penzone, Josh Vanderpoel and Ryan Usher engage in horseplay. Senior Devyn Garrett (left) plays the part of the nurse to Juliet (Flatz). Garrett, 22, has performed in 17 Ethington shows and has gotten experience in set production and costuming with an internship at Phoenix Theatre. The part of the nurse is deliciously varied — gossipy and light in the first act, the bearer of bad news and heart-stricken in what follows intermission. She has been studying the lines for five weeks, learning about every “wherefore,” “art” and “thou” so that she has a better understanding of Shakespeare and can convey his romantic language more effectively to the audience. The college’s staff and students are creating most of the play’s costumes from scratch under the creative eye of costume designer Nola Yergen, who is burning the midnight oil with her student crew to outfit the cast. Bill Symington, assistant dean of theatre and dance, and his students are building sets that look as if they could be in a painting from the Italian Renaissance, balcony and all. 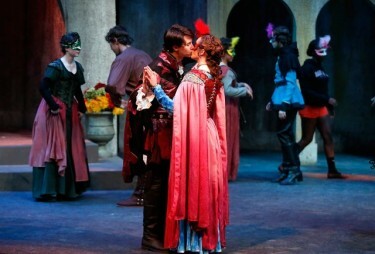 To get a sneak preview of COFAP’s “Romeo and Juliet,” click here to see photos from the cast’s first dress rehearsal.